In 2013, the Grey Wooded Forage Association and Agriculture and Agri-Food Canada supported by the Beef Cattle Research Council, Alberta Beef Producers and Alberta Agriculture and Forestry, embarked on a joint alfalfa demonstration project at the Skeels farm, southeast of Rocky Mountain House. This project originated from discussions within the GWFA regarding the lack of longevity of alfalfa stands in the West Country. 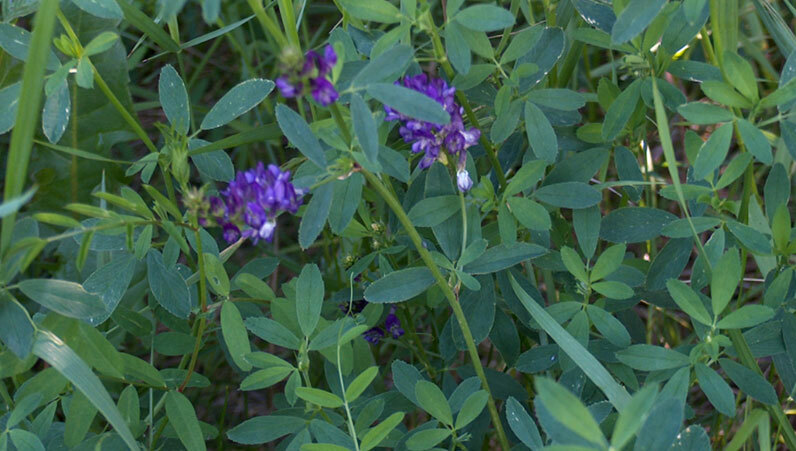 On July 1, 2013 six cultivars were planted in a plot format designed to allow us to assess the winter hardiness and resistance of different alfalfa cultivars to grass invasion. 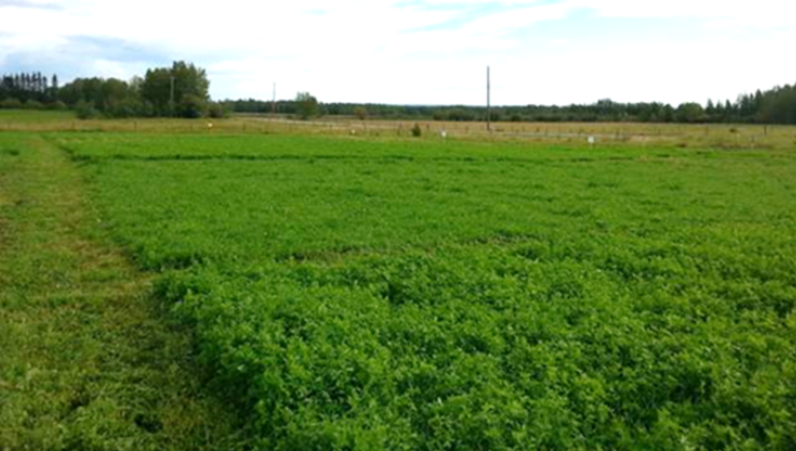 The six alfalfa cultivars were based on their longevity reputations on grey wooded soils and presence in Central and Northern Alberta. These species included the following four producer-based populations, Rhizoma (Allen Batt), Anik (D. Bartlett) Lundgard’s Falcata (a Siberian creeping rooted type) and Lundgard’s taprooted cultivar (G. Lungaard) and two from local seed companies, MV Blend (Seaborn Seeds) and Yellowhead (Secan). The seed from seed producers came from Fairview and Fort Vermillion, AB; Seaborns are from Rocky Mountain House. All of these, with the exception of Yellowhead and Seaborn’s MV Blend, are from very old seed stands, some over 30 years old. When they were selected, GWFA expected them to differ from original plantings due to cross breeding from outside cultivars. In 2014, Yves Castonguay from AAFC’s Quebec Research and Development Centre genotyped each species and found Rhizoma and MV Blend to be genetically similar, Anik and Lundgard’s Falcata to be very similar while Yellowhead and Lundgard’s taprooted cultivar were relatively unique. They established that Anik and Lundgard’s Falcata were diploids (two sets of chromosomes) and the others tetraploids (four sets of chromosomes). Most of the alfalfa we grow are tetraploids; tetraploid plants are larger than diploids and should be more competitive in mixtures. Even though Rhizoma and MV Blend are closely related they don’t look alike. Rhizoma has a wide base with rihzomes, while MV Blend is much more erect. Over the last two growing seasons, the eastern half of each cultivar plot has been harvested in late July as one cut per season and the western half of the plot has been harvested in late July and then grazed in the fall. Annual yield clips and alfalfa cover estimates have been completed to measure productivity and the encroachment of other species into the individual alfalfa stands. These measurements will continue in 2017. The cover data illustrates the dominance and persistence of genetically similar MV Blend and Rhizoma in their stands when grazed especially when compared to the other cultivars. In the absence of grazing the alfalfa cover of all cultivars decreased with the exception of both Lundgard cultivars which actually increased. It will be interesting to see if these trends continue in 2017. The demonstration at Skeels farm is a part of a larger research project. We have all of these populations space-planted in dormancy vs. winter survival tests at two locations in Quebec, Swift Current, SK. and Lacombe, AB.